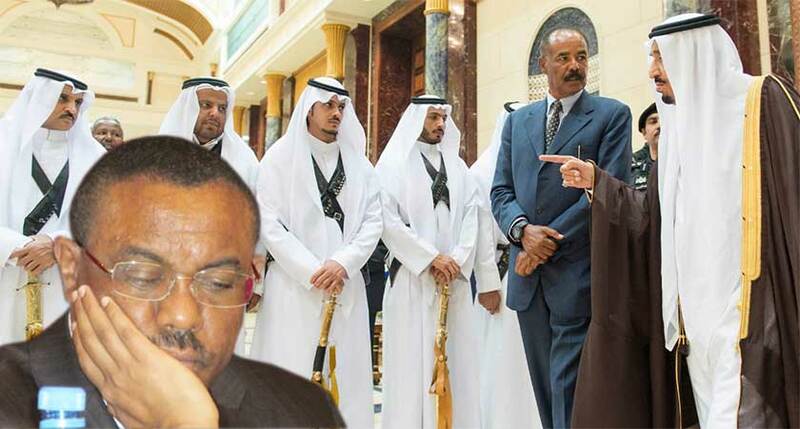 It’s now widely assumed that Ethiopia can no longer provoke a potentially destabilizing conflict against Eritrea given the procedurally shifting strategic balance between Ethiopia and Eritrea as a result of Asmara’s newly christened strategic relationship with the GCC. Because of the unpredictability of the Eritrean government and the opaqueness of the information environment within the country, it’s very difficult to tell exactly what sort of plans might be brewing in the Red Sea state. It can safely be assumed that Ethiopia will not provoke a potentially destabilizing conflict with its former province because it literally has nothing of strategic significance to gain by this, whereas Eritrea has everything of subjective benefit to acquire if it can overthrow its rival’s government, divide its territory into Identity Federalized-statelets, and possibly even repeat the Eritrean scenario over and over again until Ethiopia itself ceases to exist as a geopolitical entity. Upping the ante in any potentially forthcoming conflict between Ethiopia and Eritrea is Asmara’s newly christened relationship with the Gulf Cooperation Council (GCC), which might predictably end up getting drawn into the prospective conflict (whether directly through troops or indirectly through back-end assistance) or outright participate in conniving it as a means of derailing the rise of what would otherwise become the super region’s undisputed and multipolar leader. Any GCC support to Eritrea or even the pretense thereof would undoubtedly rattle China, which is soon to be basing some of its forces in its first-ever overseas military facility in Djibouti and has a vested interest in seeing one of its closest non-Asian allies remain stable and succeed in its fast-rising ascent. Key to China’s concern about Ethiopia’s well-being is the railroad that it constructed between that country and Djibouti, the first reliable access route since Eritrea’s 1993 independence that Ethiopia has for reaching the global economy. China envisions that Ethiopia will play a key role as a major node along the One Belt One Road (OBOR) global connectivity platform, and as such, it would likely respond in a negative fashion to any foreign military aggression against its pivotal ally. Nevertheless, there is only so much that China can and is willing to do, and providing direct side-by-side military assistance in any potential conflict isn’t one of them. However, Beijing would likely work at a breakneck speed to reach some sort of diplomatic solution in ceasing hostilities between Ethiopia and Eritrea as soon as possible, which might see it even offering its own troops up as trusted peacekeepers in the same manner as it’s already been doing in neighboring South Sudan. Positioned on a map, it’s clear to see that the GCC and Turkey are forming an encirclement ring around Ethiopia that could easily be used to exert pressure against it, whether through their support of Eritrea or perhaps even Somalia’s Al Shabaab. Speaking about the second subject and Somalians in general, if the GCC and Turkey use Somalia as a launching pad of destabilizing influence against Ethiopia, then it’s obvious that this would involve some sort of disturbances in the Somali Region (formerly called Ogaden), whether this takes the form of outright terrorist attacks or masquerades as Color Revolution-focused “protesters”. Correspondingly, if the two fronts of destabilization are timed to coincide with one another, then an eruption of violence near the Eritrean and Somalian borders could split the Ethiopian Armed Forces and make them vulnerable to internal destabilizations such as the Hybrid Wars that will be described in the following section. Of direct relevance to China is that violence in the northwestern part of the Somali Region in Ethiopia could lead to immediately negative consequences for the transnational railroad to Djibouti that transits through the area, which would thus prompt Beijing’s previously described and projected involvement in the crisis. Depending upon if and when it happens, the more time that passes until a possible Ethiopian-Eritrean Continuation War, the more time that there is for the GCC to strengthen its strategic position in Eritrea and provide decisive assistance to its new ally in shifting the currently equitable balance of power against Ethiopia. If this turns out to be the case, then the chances that China would more loudly and visibly provide support to Ethiopia also increases, and this might even reach the point of sending frontline military advisors and urgent shipments of state-of-the-art battlefield equipment. Essentially, what could easily sprout up is a major proxy war between the GCC and China over control of the Horn of Africa, and in the run-up to this potentiality, both sides could even frenziedly build up their partners’ military capabilities through what would amount to a rapid arms race in the region. Eventually, it might get to the point that the GCC compels Eritrea to ‘test the limits’ of the tense peace that it has with Ethiopia in order to acquire battlefield testing for what might then be its latest munitions, which could of course unwittingly get out of control and usher in a regional conflagration that raises tensions between the GCC and China to the breaking point by extension. The last region-wide destabilization template that could be applied in the Horn of Africa is the utilization of the two forms of “Weapons of Mass Migration” against Ethiopia and Eritrea that were earlier described in the research. Pertaining to Ethiopia, the influx of nearly a quarter million South Sudanese refugees into the region of Gambella (which has just a slightly larger population than that) might become a majorly disruptive element if not properly dealt with. The geographic peculiarities of Gambella are such that it lies on an equal plane as South Sudan does, separated from the rest of Ethiopia by the mountains that run along its north-to-south western-oriented axis. This reality is both a facilitative factor for incoming refugees and a potentially inhibitive one for the armed forces in responding to any forthcoming disturbances there. Provided that there aren’t any other significant internal conflicts at the time, the Ethiopian security services should be able to concentrate their forces enough to keep the peace in Gambella, despite the Gambella People’s Liberation Movement being one of the five terrorist groups recently united under last year’s militant umbrella and likely endeavouring to use the refugees in a self-interested Hybrid War manner. For example, this organization might be working to either arm them or the locals, seeking to sow the seeds of discordant hatred between the new arrivals and their endemic hosts so as to foster a bloody provocation that would force a military response. In turn, this might be used as per tried-and-tested Color Revolution techniques in order to smear the military for “killing civilians and/or refugees” and propagated as a rallying symbol for domestically provoking a Color Revolution (whether in the region, the capital, or all throughout the country in coordination with its regime change allies), internationally ‘isolating’ the authorities, and painting them in a negative light that preconditions the global public for accepting the intensification of regime change Hybrid War. Moreover, Gambella is so important precisely because it neighbors the Southern Nations, Nationalities, and Peoples’ Region and could be the source of a destabilizing contagion of ethnic violence that turns the diverse area into Ethiopia’s domestic version of a South Sudanese bloodbath. The other version of “Weapons of Mass Migration” that are being deployed in the Horn of Africa is the Western-originated strategy to prompt a large-scale outflow of “refugees” from Eritrea. The domestic push factor of the policy of indefinite military service mixed with the pull factor of the EU’s 91-93% acceptance rate of Eritrean “refugees” has created such a massive demographic crisis for the country that 400,000 of its slightly more than 6 million total citizens have already left over the past six years. The effect has been to weaken the economic, military, and social strength of the country with the anticipation of prompting a political crisis in the coming future, the effect of which might be a lot more unpredictable and far-reaching than what the West might expect to be a simple Rose Revolution-esque regime change operation. More than likely and owing to the specific domestic and regional circumstances that Eritrea presently finds itself in, a concerted anti-government movement within the country (whether composed of Color Revolution ‘protesters’ and/or Hybrid War ‘rebels’) might lead to the total collapse of the government, which itself could unleash a swarm of refugees to Ethiopia and Europe and possibly even elicit a militarized response from rival Addis Ababa. Additionally, the procedurally shifting strategic balance between Ethiopia and Eritrea as a result of the latter’s artificially created demographic crisis might lead Asmara to seek to strategically compensate by intensifying its new ties with the GCC, which as described earlier, could then unleash a GCC-China proxy arms buildup and even a potential war. Regardless of how far this scenario would eventually go, it would certainly lead to these out-of-regional actors doubling down on their support for their respective allies, with a distinct scenario focus being the reinforcement measures that the GCC could take in propping up its ally in Asmara from collapsing due to the weaponized demographic strain that it will definitely come under if the human outflow isn’t halted in the near future. Once again, this would trigger the cyclical security dilemma of the GCC upping aid to Eritrea while China does the same to Ethiopia, which would move the region close to an all-out continuation war, albeit one which owes its most immediate cause to the cumulative enfeebling effect that the West’s “Weapons of Mass Migration” would unmistakably have on Eritrea and its leadership’s need to strategically compensate by seeking out GCC assistance. NOTE: The above article is only the abridged version of the entire article posted at Global Research website. You can read the full content of the research directly from the source website by clicking here >>>. ወይ ጉድ! እንታይ ሃለውለዉ’ዩ ደቀይ? ትደልየኦ’ሞ ይዝንጋዓክን ድዩ ዝበሃል። ከሳዉሩ’ምበር ከጥፉኡ ዘይርከቡ መናቖቲ መሲሃን። ከም ድልየትኩም ትምኒትኩምን እንተዝኸውንስ ክሳብ ሎሚ’ውን ኣይምሃለናን ነርና። Don’t worry Mr. evil expert, Eritrea will survive and wither away all your evil predication. Hatew ketewe …. Hatef tef …Balder lewe .. This guy seems to ride the “if” horse into the horizon! What rubbish you write my friend! This is a total rubbish! Not worth reading. Garbage in garbage out! It could be one of those “fake” news sites to get plublicity or achieve some shock value. The author is Russian and teaches at a university in Russia. He could be Russian Jew. This Jewish people live in fear. The Jewish like their European counterparts see African as followers not masters of their destiny. This article is total B.S. His research seems based on Western propaganda. Why the hate? What are you trying to hide? You call yourself true Eritrean? LOL. Hizbawi why don’t you wake up?? It is natural to hate people that hate you. I know the jews can care less about you. If you don’t believe me ask your people in israel… that is if you are Eritrean yourself. Is it because he said, he’s probably a jew? What you gonna do, if he doesn’t shut up? Cowards, threaten behind a computer screen. Weed doesn’t give your this worldview, my friend. His drunk on #fakenews so he/she decides to play geopolitical game without understanding Eritrea’s position and history. More importantly, China has never played this role of taking sides in it’s entire history. They built the Great Wall of China to keep the barbarians out of their land. China only knows by selling China products. And believe me, they would rather deal positively, economically and politically with the majority of Ethiopians not woyane controlled party. Hey smoking weed does’t make you write rubbish as the above article but , alcohol does. This is a junk story. I couldn’t even pass the first paragraph. What a waste of time and resources. A diabolic thinking and evil wishes of a moron or mentally unstable person! An article that belongs to be in a slaimmbacket. I thought I was reading The Enquirer for a second. This is just trash. It’s an interesting read but missing facts and not connecting the dots makes it Hollywood. The Africans will kill each other while dividing it between the big boys has been buried with Mussolini. The horn for the first time control its own destiny. Somalia for the first time turned away Egypt’s money to destabilize Ethiopia, turned out we weren’t there for shooting practice. Djibouti is creating jobs faster than most and Sudan is finally peace while Ethiopia cleaning keyboard freedom fighters and finishing the dam, so much for hybrid war. The only wow factor will be Yemen and Qatar leaving our back yard very soon. Your blabber is just as bad as the article itself. Ethiopian minority genocidal regime is abusing its people while completely taking orders from the US and the British governments never mind charting its own destiny. Somalia is essentially an extension of Woyane and only fulfills the wishes of the Woyane masters. Djibouti is a confused nation that is nothing more than a vassal state full of just bases for other interests. South Sudan is a victim of US policies, and quickly unraveling. Eritrea is the only proudly independent nation that is charting its own path despite the tremendous political, diplomatic, military, and information warfare that it sustains from Woyane’s handlers. So, so much for your “yeteseneteke” chinklat! The new fashion in politics to make money is to write a trash notes and name your self Peace and Security, Global Research Website, Atlantic council, peace and co-operation worldwide etc. all this kind of organisations are there to make believe concocted stories and grab he lime light and money, bingo, le the poor die and die!!! I read this at aigaforum and TOL before. They are using it and will use it as a Propaganda Machine to confuse their people. The ‘Expert” on question might not have any experience at all other than reading about the region online., like the Amateur US Diplomats–the likes of Susan Rice and Jendayi Frazer, fresh grads from school with PhDs, who were assigned to/on African Affairs to get some basic experience.. They think china is a kid to wage a war on Eritrea or the GCC. China remained mute and did not do anything major about the S Sudan crisis to save its Mega-million Oil Project. This chap has no clue that China might do more business or equal business with Eritrea vis-à-vis Ethiopia and keep things balanced and eat with two spoons / with both hands from both nations. The Pseudo-Researcher has no clue about the Huge Eritrean Natural Resources potential that can change the game overnight.. This Gas and Oil Exploration thing might “blow up” the minds of most Nations and Politicians and Strategists in the world including China. Just the Huge Potash Potential(unclassified rumors say that the Potash In Denkalia,in fact, goes beyond Culluli and Bada and Colluli is said to be only 30 % of the potential, which will make the Mine Life to be extended to 500 years. Hence, all the above Huge Potential will rather make China to be behind Eritrea, not after Eritrea. 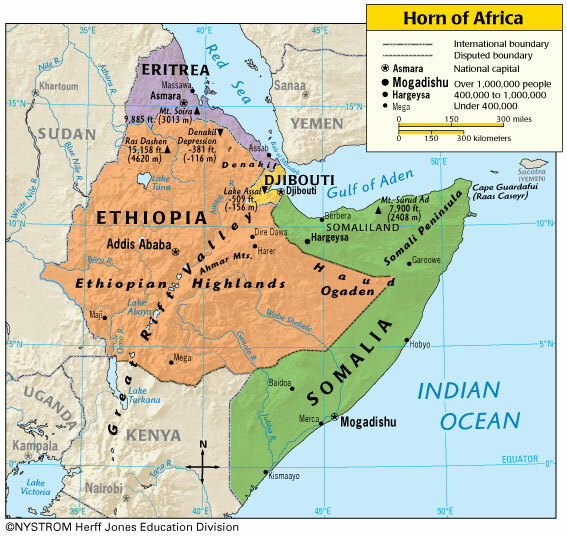 Contrary to the assertion made by the War-Mongering Pseudo-researcher,the ONLY positive thing will be that the Power in the Horn will be balanced and Peace will prevail in the Region.as Ethiopia will no more have a chance to bully its neighbors including Somalia as the GCC along with Turkey will diffuse the …negative wind. The author appears to be clueless about the region or he may be just a starter. He is every where from East to West from North to South. I wonder if has ever been outside his country. Well, he may be right in a sense every body is writing and he may have said why not try and what does I loss by trying. In this century, they travel one or two time to Africa, they take one African Geography course and if lucky will get to serve as an internship in African countries for free or they will volunteer to work in African country for free through their church and the next day they are back to their country, they experts in Africa, African security advisers, etc…and in few years they will collect enough money to open up an organization or an African Security Research Center in they their capital. What a world. This Andrew Korybko is an ignorant person. I wouldn’t even know where to start. Let us just say the article above is TRASH. Tesfanews should be ashamed of themselves to feature this article. Korybko must be a Weyane nick name. Otherwise, who would masquerade a Weyanesque propaganda as a “research?” The whole thing is just a dreamy speculative analysis that one is forced to reject its contents right from the first paragraph. Any analysis that takes the Weyane propaganda of the last two decades or so as fact cannot be considered seriously. I wonder if this article was written as a spin on the current situations in the hope of instilling fear among Ethiopians and rallying their support to the troubled Weyane at its eleventh hour. One fact the author has gotten right is the migration that the Weyane’s bosses have managed to generate artificially. Exactly my sentiment! Again, one of those “regional experts”? I think anyone of the commentators on this page could write a better speculations. One exception, whomever wants to stop what China is doing in the region could support the GCC, and that would make Eth run back to her mom’s bosoms/the US. As we all know now days Ethi is flirting heavy with China. Welp, this is just crap on top of crap. I guess they can’t swallow the hard truth — an African country playing the game like a boss. Soon on its way to become a power house. This guy is on heroin! Maybe TesfaNews is on it as well. What I would like to know is why Tesfanews allowed this hocus pocus to be posted? Is this for pay? or flat out naivete? Please remove this from the website if you want to maintain the rapport you enjoy from peace-loving and genuine Eritrean populace. There are many ignorant people like this Andrew Korybko who write about something they hardly know anything about it. But we wouldn’t know about them because nobody would publish their work. How TesfaNews decided to carry this rubbish is mind boggling. The above article is simply TRASH, authored by an ignorant person. Shame on TesfaNews to feature this TRASH. Can’t the editor(s) read? He who goes with TRASH is TRASH. Are you desperate for attention??? Yes, for the attention of the TesfaNews editors in order to have the TRASH above removed. And you obviously had no clue what my post was about. Did you read the trashy article above? O My my ! I think this article is written by weyanit oq Weyanit cadre for graduation ESE .I have no clue what on earth is written about.It is Rubbish it belong to the Garbage bins seriously .